The Standard reports on the bridge’s closure 11 April 2019. At the A4 trunk road roundabout in Hammersmith there is plethora of signs warning motorists of the closure. The northern approach to the bridge with contractors on stand-by. 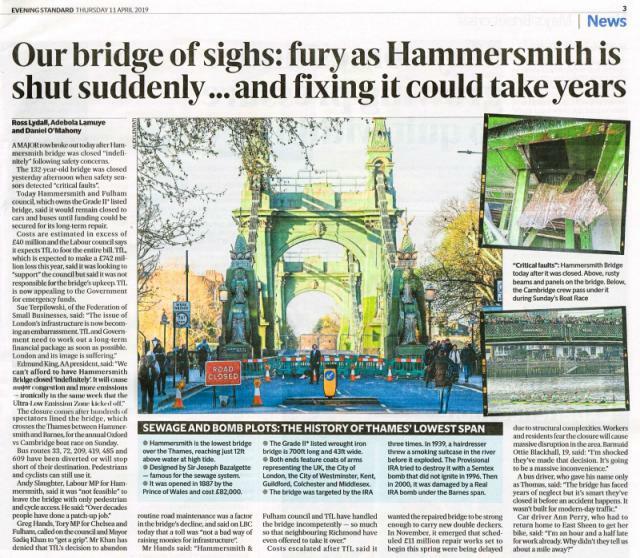 Its been known for a very long time that Hammersmith bridge has many problems. Until perhaps twenty years ago double decker buses and heavy lorries could use it but then that ceased and only light traffic and single decker buses were allowed. The bridge has previously had prolonged closures as the council sought to undertake outstanding repairs to the structure. 1887 – the year the bridge was completed. Why is the bridge so problematic? Well its very old and the fact its a suspension bridge means it moves, it wobbles, it vibrates, its structure is flexing to a considerable extent. This means bits and pieces eventually crumble, fall apart, split, under the constant pummelling the bridge receives from heavy traffic. It wasn’t built to carry the sheer amounts of weight it does these days. Considering the state it is in and the fact it has managed to hold up extremely well in the light of the extreme modern day demands of traffic is even more astonishing. Part of the bridge’s considerably damaged road surface. The Menai bridge, the granddaddy of them all, has been a hugely important crossing in both social and economic terms and very fortuitously has received extremely heavy engineering work to give it substantial extra strength (without altering its structure) and survive the increasingly heavier traffic that has come to cross it. Since the eighties the rebuilt and reconfigured Britannia bridge nearby has provided a huge relief for Telford’s famous suspension bridge and now carries the bulk of traffic to Anglesey. Overall the road surface looks fair but a close look will reveal it is atrocious. According to Hammersmith & Fulham, the bridge is apparently quite unique as far as suspension bridges. They say the only other example of this kind of structure is in Budapest – which is the Széchenyi Chain Bridge. That too was designed by the same guy who conceived Hammersmith bridge – William Tierney Clark. The difference however that at Budapest is a rebuild of the original which was damaged in World War II, and thus more substantially built to cope with the much heavier modern traffic. Another of Tierney’s bridges, at Marlow, hasnt had the same constant pounding of heavy traffic as Hammersmith and has also been fortunate in having a by pass opened in 1972 which gives huge relief to the older structure. Hammersmith bridge is of course a rebuild too, being based on the original structure it replaced in 1887 except the pier towers were of iron and not stone. Example of a metal plate that has been smashed and in turn damaged the timber structure beneath. There isn’t really a reasonable alternative to crossing Hammersmith bridge. Some may argue and say this is rubbish but it depends on where one comes from. The area on the opposite bank south of Hammersmith is essentially a peninsula and the alternatives at Chiswick and Putney involve lengthy detours. Not only that Hammersmith is a nodal point in terms of London’s roads system and invariably many want to cross the river here because it is more straightforward. Picture from May 2018 showing newly laid metal plates on the bridge deck then tarmac placed over the top of these. The council says the bridge has around a thousand metal plates underneath the roadway and it takes six hours just to replace one of these. When one of these plates goes it involves a lot of considerable work and expense – its not just that the wooden beams below have to be repaired/strengthened. The constant pounding of vehicles can easily smash these metal plates no matter how well they are secured. And when one of these plates has been smashed the wheels of vehicles then invariably pound the timber decking beneath, the constant pounding pushing the timber decking out of place and breaking up the wood. No sooner that repairs have been done the wrecking of the bridge starts all over again. In my view it must be an almost thankless job trying to keep the bridge open and the traffic happily moving, especially when it is the traffic that is the bridge’s worst enemy. In many places the roadway has worn so much these bolts stick out like sore thumbs! There has been claims the boat race the previous Sunday (a week ago today) caused problems because of the massive crowds that ventured upon it. A Reddit user claims that every day since the event there have been ‘guys in hi-vis inspecting it.’ (Reddit.) So it seems, for all one knows, something may have given at that point. Another example of poor road surface caused by the constant flow of vehicles over the bridge. This is actually the road surface that was in use until a few days ago! More damaged metal plates and exposed timber work. There is evidence of plywood having been used too. I have wondered about the use of plywood. Its probably a means of repairing patches of the roadway where the decking has distorted and the plates and timber beams are no longer level and should be seen as a temporary patch rather than a permanent repair. Its evident the plywood doesn’t last long! However I have often wondered about the rest of the structure. It doesn’t seem to receive very much care. These pictures are not anything special anyone can see the state of the bridge in these places, and I am sure many must wonder how the bridge is being allowed to get into this state. Perhaps the bridge really is rotten and no amount of work – apart from a complete thorough overhaul job, – will put things right? Broken pipe work with wires showing. Perhaps the bridge is literally being shaken apart and its a thankless job trying to nip all the problems in the bud with limited resources and limited hours of access and all available resources are being put into just keeping the structure open and the traffic moving? Lots of weeds growing in the cracks of life expired timberwork. More weeds and grass sprouting from life expired timberwork. There has been a lot of work on the bridge over the years. There is a lot of steel work on the structure stamped Dorman, Long & Company of Middlesborough. This probably denotes strengthening work that was done in the seventies. Sadly the wooden railings along the footways too need urgent care. Even the bases of some of the lamp posts have split! There is evidence gaffer tape has been used – and some of my earlier photographs do show black gaffer tape used for these instances. Sensors have been used right across the bridge to monitor its integrity and check for any serious movements in the structure. Many visual checks are made and there is a cradle that runs underneath the three spans so workmen can inspect the structure where it is above the river. I should think its pretty much a constant drain on resources simply monitoring the bridge for any slight movement that may occur and then having to call out contractors to undertake urgent repairs and at the same time shut the road down whilst these are underway. General view showing it is a nice and attractive, Egyptian, slightly gothic, styled bridge. The looks are very deceptive though… The stone piers are from the original bridge that stood here. Its been mentioned that the bridge wobbles quite alarmingly when traffic passes over it but it must also be added that when people walk over it wobbles too! Invariably because of the bridge’s age and design it resonates to every little movement that occurs. Sometimes I think it needs a good network of hi-tec dampers installed somewhere, perhaps underneath considering its a Grade II* listed structure, to help reduce the vibrations, wobbles etc. They achieved that with great effect at the Millennium bridge (by the Tate) further down stream. There are a number of basic dampers on Hammersmith Bridge no doubt installed decades ago and these can be seen beneath the roadway. Some of these are missing, perhaps no doubt themselves having become a victim of the bridge’s constant rocking. It is clear there has been various attempts at strengthening the under deck and some of the timber beams have been replaced. On some parts strips of wood have been used! The structure here seems in really poor condition judging by the rust and the way the galvanised steel struts have been pushed out of place. I think the real purpose of these timber cuts is not to repair but rather to indicate if there is any serious movement. If that does happen then these timber cuts will indicate the amount of movement by warping or even splitting. Sign from 2015 dumped underneath the bridge! The land the bridge sits on at its southern end belongs to Richmond… and this is a Richmond council sign! I’m quite unhappy about the fact that there does seem to be some sort of neglect in regards to the bridge. This for example is one of the power boxes that contain the wiring and fuses for the bridge’s lighting and the doors are invariably wide open for everyone to see. I dont think there any locks! Let’s hope the issues are sorted soon and that the bridge can receive some real serious TLC. Its either that or close the bridge altogether – except to cyclists and pedestrians – I must say it is lovely walking across the bridge without any traffic whatsoever and many are finding it is a great pleasure too. However businesses, commuters, motorists and the likes are angry because the bridge’s closure is causing many problems.